Pearl Sun and Bryce Ryness in Long Story Short. Photo by Matthew Murphy. BOTTOM LINE: A bittersweet and tender look at the tribulations and joys that take place during the course of one 50-year relationship. The aptly named Long Story Short introduces Hope and Charles, two people who meet as awkward 20-somethings and fall in love. The play then catapults the audience through five decades, during which we’re made privy to a host of life events – from child-bearing to child-rearing, from personal tragedies to moments of unbridled triumph. The breakneck pace of the production works. 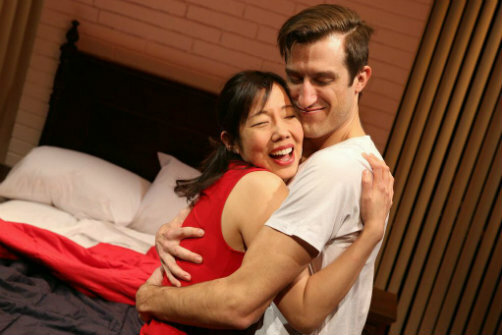 What’s more, the fact that Charles (Bryce Ryness) and Hope (Pearl Sun) never visibly age on stage makes this a remarkable feat. The snappy writing and poignant music are subtle lures, and while Sun’s voice is the stronger of the two, the evocative snippets that are presented form a tapestry of a marriage, with ups and downs, disappointments and pleasures. What unfolds is a mature relationship, no doubt a reflection of writers Milburn and Vigoda’s own 20-year musical collaboration and marriage. That said, the play does not fully interrogate the racial and ethnic differences between Hope, who is Asian-American, and Charles, who is Jewish. When the latter insists that his daughter—a character who is never seen but is nonetheless frequently referenced—have a Bat Mitzvah, Hope immediately acquiesces. This begs the question: Why doesn’t Hope demand that her child learn about her Asian heritage? It seems like an odd and disingenuous omission and something of a misstep. On the other hand, Long Story Short might have eliminated all reference to ethnic identity, leaving it to the viewer to decide if their dissimilitude is meaningful or meaningless. As written, however, the occasional references to race and religion are inadequately developed and are a distraction in an otherwise beautiful and surprisingly realistic story. The chemistry between Sun and Ryness is visceral and David L. Arsenault’s simple set design—an uncluttered bedroom with the suggestion of other rooms on either side—allows the focus to stay on the couple. The out-of-sight band, performing from behind a screen, never usurps the action but is complimentary. What’s more, Grant S. Yeager’s lighting design cleverly and effectively indicates time and mood changes without many décor shifts. All told, the mix offers an intimate glimpse into long-term love and the ebbs and flows of passion and commitment. There’s humor here, and pathos too. Whether you believe, like Charles, that some relationships are bashert, the Yiddish word for meant-to-be, or share Hope’s belief that destiny is decided in utero, Long Story Short is a stirring affirmation of the human capability to nurture, support, and endure.